This product information page is designed to help you decide whether the Hozelock Cloud garden watering controller is right for you. It includes links to the top online retailers’ websites to save you time finding the best deal. 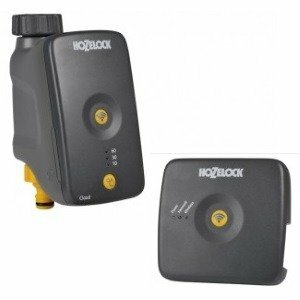 Where to find the best price for the Hozelock Cloud Controller. A battery-operated tap-mounted watering controller which can be controlled via a smart phone app. Suitable for use with a mains water supply. The Cloud Controller connects directly to a garden tap and to a hose pipe (which may in turn be connected to a garden sprinkler or an irrigation system). The Cloud Controller is easy to set up and includes a Hub that is connected directly to an internet router (not supplied) to provide a secure system that doesn’t need a complex pairing process. No programming skills required.